Tiny Tag – Mini Laser Tag | OhGizmo! As someone who now works from home but once worked in an office setting I feel it’s my duty to help reduce the level of office productivity around the world by posting various gadgets that provide a great alternative to doing actual work. Today we have Tiny Tag which is just like the Lazer Tag game from the 80’s but without the ridiculously large gun, vest and helmet which you can probably only pull off on casual Friday. 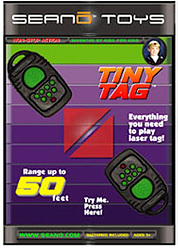 Tiny Tag takes all 5-minutes of fun you can have with real Lazer Tag and stuffs it into a keychain size package. The two-inch battery powered devices can fire up to 50 feet away and when you’ve been hit will scream ‘LOSER’ so everyone in the office knows what you really are. While Tiny Tag is available from Perpetual Kid for $11.99 I think the actual cost in terms of lost productivity in offices across the nation will be in the millions. Great potential, but we need some cool ways to spice up tag. For example, (1) Use these at work, but you can only be tagged by another if you don’t see them first (if you see them, they can’t tag you for the next 5-15 min). The person who is IT by the end of the workday buys the others the first round of beer at happy hour; (2) Great to use in games like “killer” http://www.sjgames.com/killer/; (3) There could probably be a fast paced chase version with biking through a city. Um, I just ordered and got my pair, and it didn’t seem worth the $12. As quoted in my blog (www.SparkBugg.com), they were simply cheap, inconsistently performing, barely-audible trinkets.